You may not think these combined ingredients earn the title of “burger”, with good reason. You may say they’re more fittingly called ‘patties’, as they probably are. The difference is often subtle but we all recognize it intuitively. And actually, the original source of this recipe refers to them as ‘cakes’. But never mind. They may be little more than zesty, healthy homemade refried beans held together with a light, almost crispy coating, but what respectable fan of refried beans wouldn’t devour that in burger form? Sometimes I feel twinges of guilt that little F has not experienced meat in his three years and three quarters life. Despite the fact that I am wholeheartedly behind our family's reasons for our plant-based kitchen, there are moments I feel like I'm somehow misleading him. Food is as full of nostalgia as it is fuel. The other week, while grocery shopping, I heard a startled gasp as little F suddenly pointed at a package of red meat. "Red worms, ewwww!" he cried. Later that same day, we had a new sitter come to the house while I worked upstairs, and I got to listen in on the giddy fun of their engaging conversations. Little F had taken to her immediately, resulting in the sort of giddy, wild "showing off" that is funny, silly, and borderline overly rambunctious. They were playing kitchen, and I heard the sitter (who happens to be vegan) ask, "Do you like burgers?" as she picked up the plastic replica. "Sometimes," little F answered. "Sometimes they're good, sometimes they're yucky, like poo poo yucky." It was fun eavesdropping just a bit, and a little thought-provoking, too. I wondered, why didn't little F treat Ms. Andrea to the same lecture-style response he has given both his grandmothers (e.g., "we don't eat cow's milk, Ammy", or "maybe butter is kind of gross, Nanny")? And then I thought, oh yeah...he doesn't know. He doesn't know what a typical burger, hot dog, or even pizza is. He even makes a point of clarifying during imaginative play that his misbehaving animal friends are eating "tofu poo poo" when they indulge in excrement. I don't want our sweet boy growing up feeling like he is missing out, or developing issues around diet, forbidden foods, and power of choice. Hopefully we will keep on figuring out ways that feel right for sharing different ideas and options, showing respect for his evolving choices and keeping the conversation going. It does ease those creeping anxious moments when I can remind myself how satisfying and yummy the burgers we do make are. Preheat oven to 200 F. Combine the salsa, cumin, black beans and walnuts in a food processor and pulse until smooth. Transfer to a mixing bowl and add bread crumbs, scallions, salt and pepper. Divide mixture into small patties, roughly ¼ cup each. 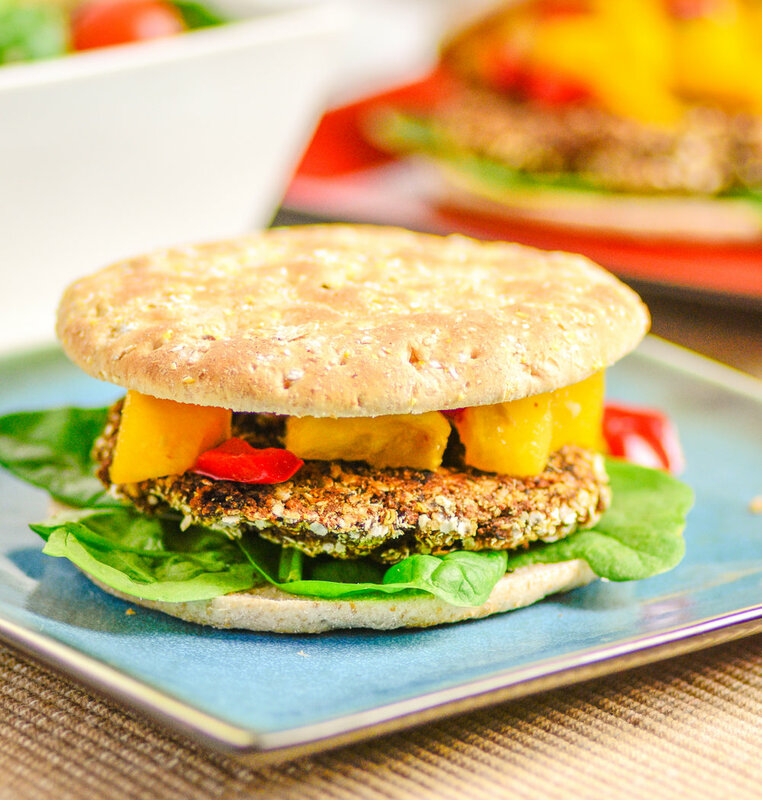 Dredge patties in quinoa flakes and refrigerate for at least 30 minutes (alternatively, you can chill mixture in bowl and form into patties later. Heat a nonstick large skillet over medium heat. Using cooking spray saute approximately 3 minutes per side, gently turning. Place on a baking sheet and keep warm in the oven until all patties are prepared. 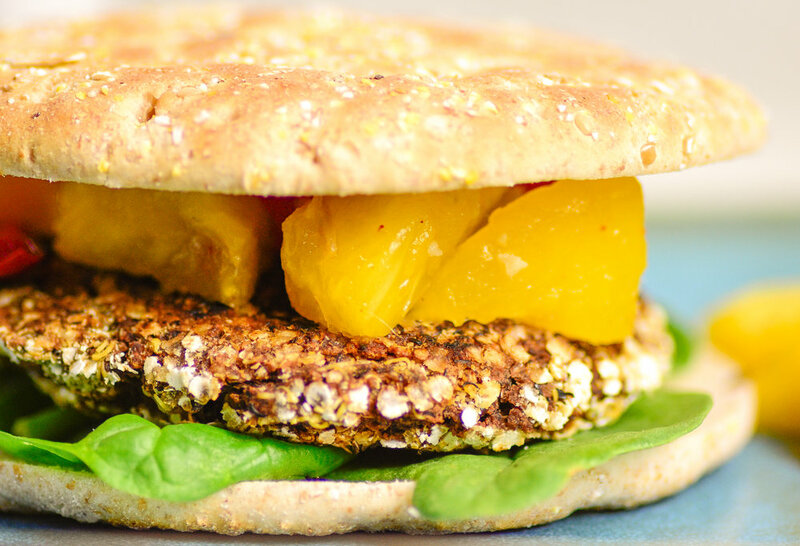 Great served with mango and pineapple salsa or your favorite burger fixings.